with dilation at most 2 and prove its correctness. Let G and H be finite graphs with n vertices. VH denote the vertex sets of G and H, respectively. one computer architecture by another . A tree is a connected graph that contains no cycles. hierarchical relationship among its various elements . communication graph into a hypercube multiprocessor. ded into a hypercube with constant dilation . as into its next-to-optimal hypercube with dilation one. remain open for the general case. 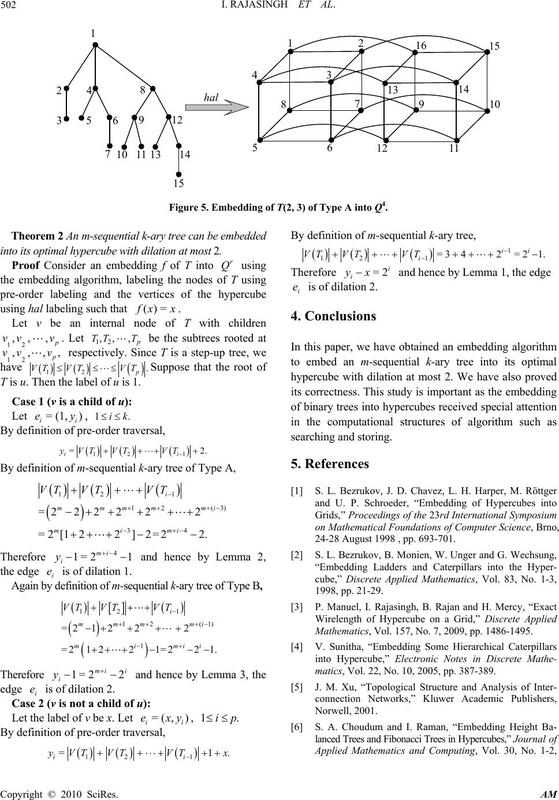 timal hypercube with dilation at most 2.
that enable us to prove the main result of this paper. r-tuples differ in exactly one position. Q be an r-dimensional hypercube. notation jiQQ < shall mean ji QQ  and . of the binary gray code sequence . cycle is said to be a hamiltonian graph. is a hamiltonian cycle in 1.
vv are edges in . vertices u and v in . where z is the label of some vertex w in . 1,mr then 1=),( vud in . 1,m,ir then 2=),( vud in . some vertex w in . solution to the equation 1=22 . embedding algorithm and prove its correctness. isomorphic to one of the graphs shown in Fi gure 2. Figure 2. A subtree of order 3 or 4 with v as a root node. time we visit the nodes in the traversal. See Figure 4. 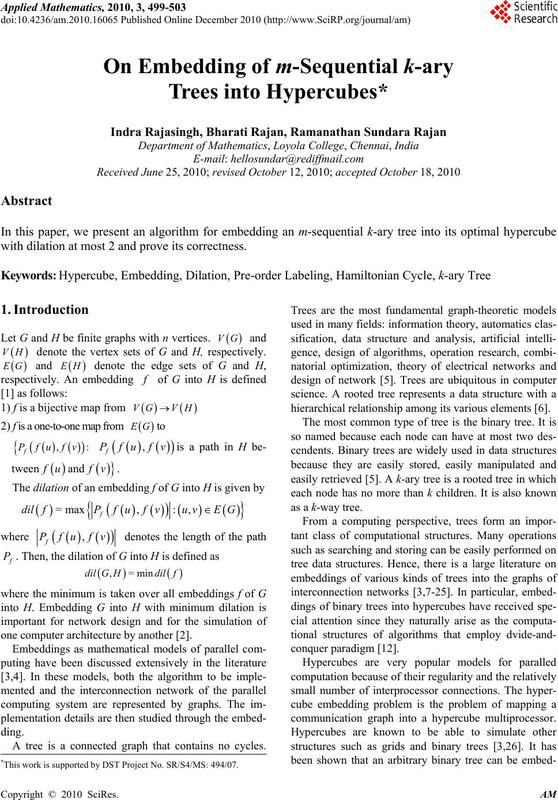 Input: ),(kmT and its optimal hypercube . most 2. See Figure 5. Figure 3. (a) T (2, 4) of Type A; (b) T (3, 2) of Type B. Figure 4. A pre-order labeling of nodes of T.
Figure 5. Embedding of T(2, 3) of Type A into Q4. into its optimal hypercube with dilation at most 2.
using hal labeling such that xxf =)(. T is u. Then the label of u is 1.
e is of dilation 1.
e is of dilation 2. 24-28 August 1998 , pp. 693-701. Mathematics, Vol. 157, No. 7, 2009, pp. 1486-1495.
matics, Vol. 22, No. 10, 2005, pp. 387-389.
mation Sciences, Vol. 178, No. 11, 2008, pp. 2396-2405. Casopis. Pest. Mat., Vol. 97 , No. 2, 1972, pp. 201-205. L. Nebesky, “On Cubes and Dichotomic Trees,” Casopis. Pest. Mat., Vol. 99, No. 2, 1974, pp. 164-167. LNCS, Springer-Verlag Vol. 319, No. 24, 1988, pp. 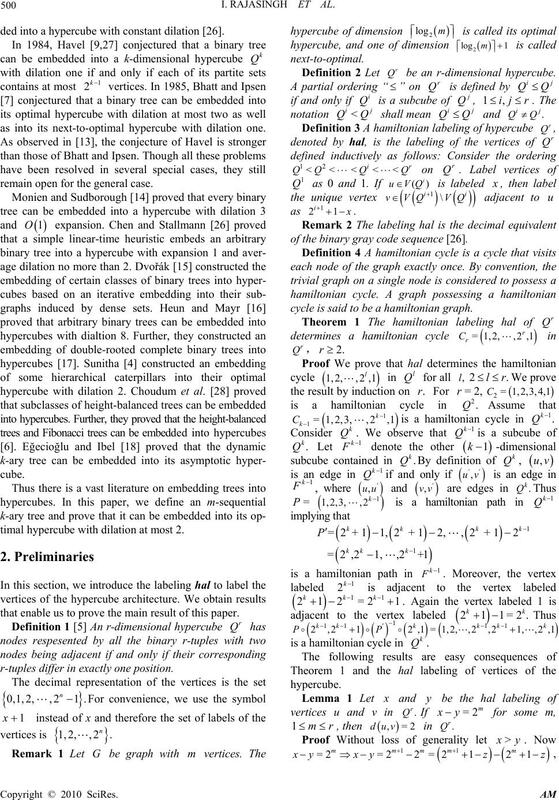 into Hypercubes,”Discrete Applied Mathematics, Vol. 155, No. 4, 2007, pp. 506-514. No. 8, 2001, pp. 1110-1125.
rantium, Vol. 126, 1997, pp. 21-32. 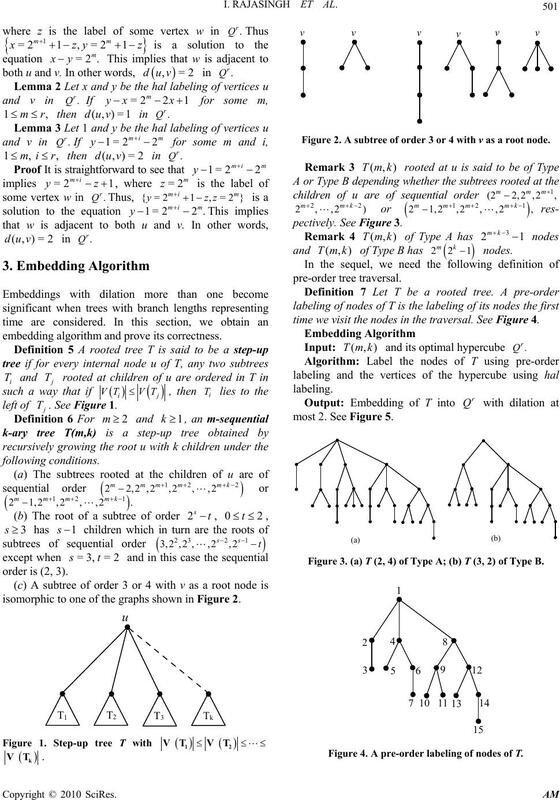 Paths in (n, k)-star Graphs,”Information Sciences, Vol. 178, No. 3, 2008, pp. 788-801. Vol. 177, No. 24, 2007, pp. 5590-5597. Information Sciences, Vol. 177, No. 19, 2007, pp. Distributed Computing, Vol. 24, No. 2, 1995, pp. 132-138. 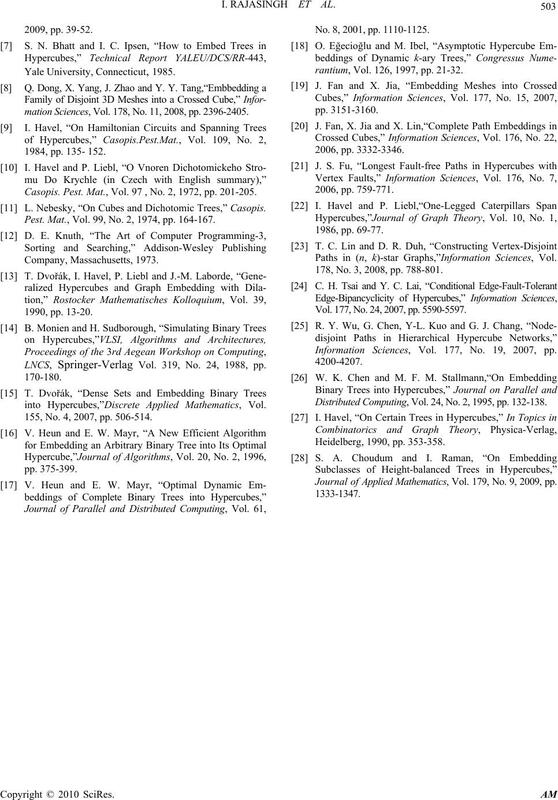 Journal of Applied Mathematics, Vol. 179, No. 9, 2009, pp.